Providing you the best range of mix value note counting machine mx50i turbo, turbo value counter machine, maxsell note counting machine, smart currency counter, basic money counter and note counting machine with effective & timely delivery. · Optional Printer to take the Print out of Denomination Breakup - Makes it easy for attaching denomination details for cash received. 100 - 240 AC Voltage / 50~60 Hz. MX50i Turbo- advanced value counter offered by us is the perfect for counting mixed denominations without separating them Count All in One Go. Just place the bunch of notes on the hopper and Turbo does the rest. Its Award winning the design for Euro Notes as tested by European Central Bank, Guarantees excellent performance for Indian rupees as well. It is India's Best Currency counter Packed with Features that you have never seen before. Designed to meet RBI Guidelines for Pre-2005 Currency Detection. 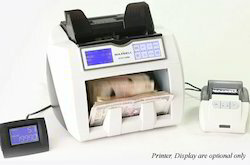 Europe's Top-Selling Banknote Counter, Developed for Indian Rupees - MX50i Turbo. New Function Pre-2005 Mode under Beta Testing. Just Try our MX50i Turbo, We Guarantee, You 200% Satisfaction with Its Functions, Features & Ultimate Convenience. 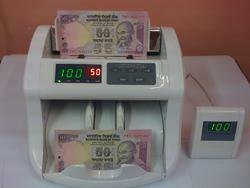 MX50i India's Largest Selling Currency Counting Machine with Fake Note Detection Feature. Ask For Latest Upgraded Chipset To Detect Advanced Fake Notes. 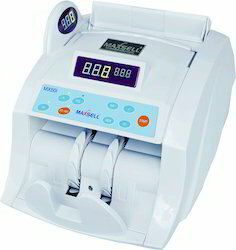 Maxsell item code MX50i - Intelligent Note Counting Machine. 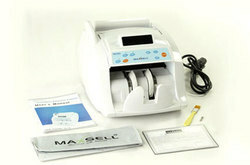 Our new intelligent counting machine -Maxsell MX50i is featured with technology, utility, affordability. The note counter has high precision sensors and advanced ISCAN technology that provides the scope of identifying counterfeit currency while counting. With its advanced digitized technology, the machine can be adjusted to different detect levels, making it ideal for fake notes that can circulate in future. Due to its instant detection capability, the suspected currency can be returned to the customer over the counter. With a strong electronic design and very stable software, Maxsell MX50i makes no mistakes in delivering accurate results. MX50i money counter has been designed with RoHS accreditation additional to ISO & CE certifications. Detects Super Fake notes in the various denomination - Rs. 1000, Rs. 500 & Rs. 100 with I-Scan Technology. High voltage protection through external fuse system that even the user can change. Additional easy to wear dust covers ensures free from dust and other objects when not in use. Power consumption 50 watts during operation / <10 watts during nonoperation. Counting technology highly reliable in sensor technology for accuracy & durability. Digitized due to its advanced electronics and intelligent software. Error codes different error codes for different note errors, Double note, chain note, half note, cut note & soiled notes also. Buy MX50 Smart+ If you are looking for Economically Priced with good performance & accuracy. MX50 Smart+ Cash Counting machine with Fake note detection instantly. It's economically Priced, yet reliable and stable in performance. MX50 Smart+ is designed for Smooth counting with wider Hopper size and takes up a load of currency with ease. 1 Year Warranty. We use only Original Factory parts for Service & Replacement. Our competency lies in providing our clients with an optimum quality Basic Money Counter. Fast, smooth & stable counting performance, the provided money counter is manufactured in compliance with industry norms. Also, our money counter is supervised on set guidelines from our quality experts in order to assure its flawlessness. This money counter can be availed in various specifications as per with the customer’s requirements. We are Leading Suppliers of Note Counting Machine In North India. 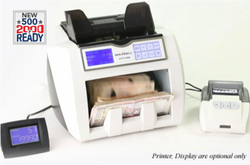 Maxsell Currency Counting Machines are available with Counterfeit detection of High-quality Fake notes while counting itself. Maxsell MX50i which is India's Largest Selling Loose note counter with Fake Detection identification feature is used by All Major Banks, Small, Medium & Big Business Establishments. The machine assures Highest Accuracy at An Affordable price & Zero Maintenance. Maxsell MX50i Turbo is an advanced value counter equipped with latest Features that no other Note Counting Machine can match in India. MX50i Turbo has functions which are in line with Guidelines of RBI for efficient currency management. More than 1 Lakh satisfied customers using Maxsell Currency Products like Currency counter, Fake note detector, etc. Tested at some of India's biggest Banks at their currency chests with millions of currency notes and hundreds of fake notes from various sources, MX50i has proved its accuracy to detect fake notes UPTO 100%. MX50i money counter is accredited with RoHS, ISO & CE certifications. 210 ~ 240 AC Voltage / 50~60 Hz.